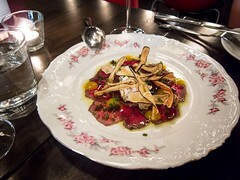 In 2014, my dinner at Bar Isabel was one of my favourite eats of the year. Since then, Chef Grant van Gameren has opened another restaurant, Bar Raval that I’ve fallen equally head over heels for, this time drawing inspiration from Barcelona. 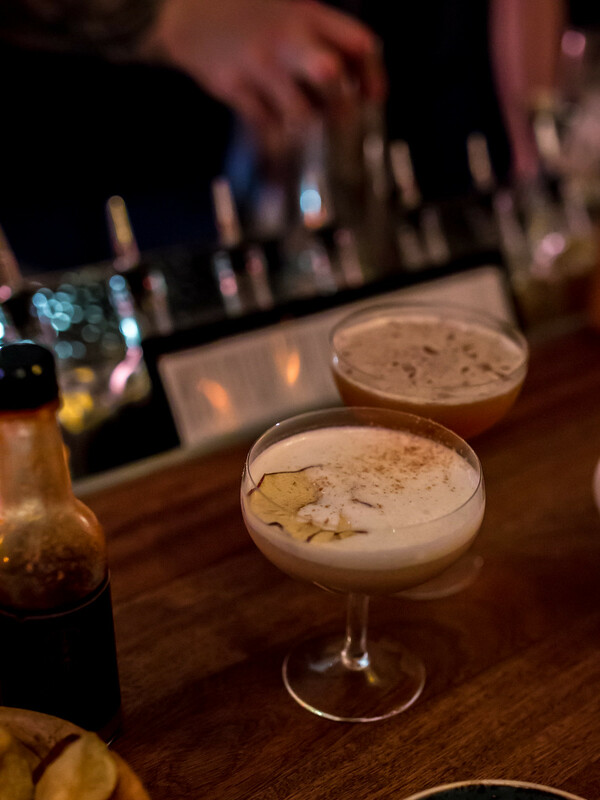 Bar Raval features a stunning mahogany bar that winds around the restaurant, turning the space into a cozy wooden grotto. Just walking into the space, I felt like I was in no longer in Toronto, and this was before the food had even arrived. 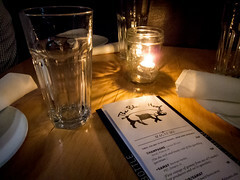 Atmosphere: After an afternoon walking the One of a Kind show and sampling artisan fudge, The Hubby and I had worked up an appetite but wasn’t starving. 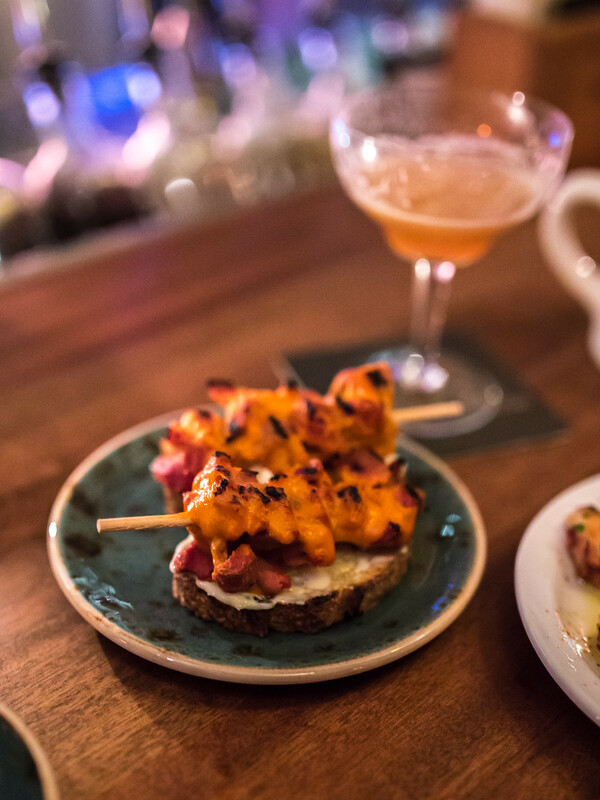 This was the best state for visiting Bar Raval, known for their no reservation policy and notorious wait list. 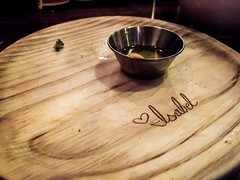 We left our names with the restaurant and crossed the street to sip coffees at Aroma until a table was free. After about 30 minutes, my phone rang. Walking into the restaurant, we were directed to an open spot at the bar. Bar stools were first come first serve and most of the diners were leaning on the expansive bar or around barrels that served as cocktail tables. Hooks for jackets and purses were available at intervals under the bar. The restaurant was packed with bodies, and every time I turned, I hit someone with a limb. With music playing and plenty of chatter, the noise level inside was pretty loud. You had to get close to each or yell a little to be heard. 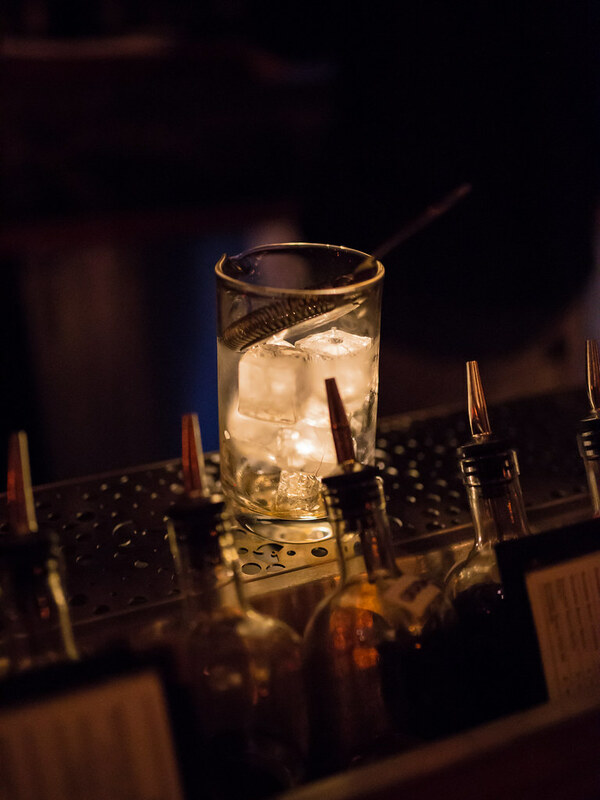 Being an “it” restaurant, Bar Raval’s crowd was ideal for people watching. 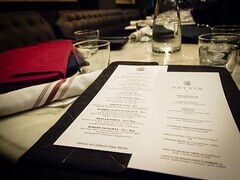 Service: Even though the space was more casual and bar like, we had a dedicated server to show us the menu, take our order and check in on us throughout the night. 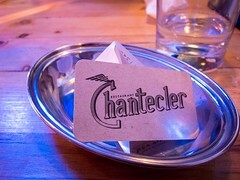 Each dish was served with a detailed explanation. We ordered drinks directly from the bartender, who was impressively efficient at multi-tasking. I felt like I could really improve my time management skills by watching him work. Food: For drinks, The Hubby and I each ordered a cocktail. Both had a long list of ingredients, took several minutes to concoct and most importantly, boozy. 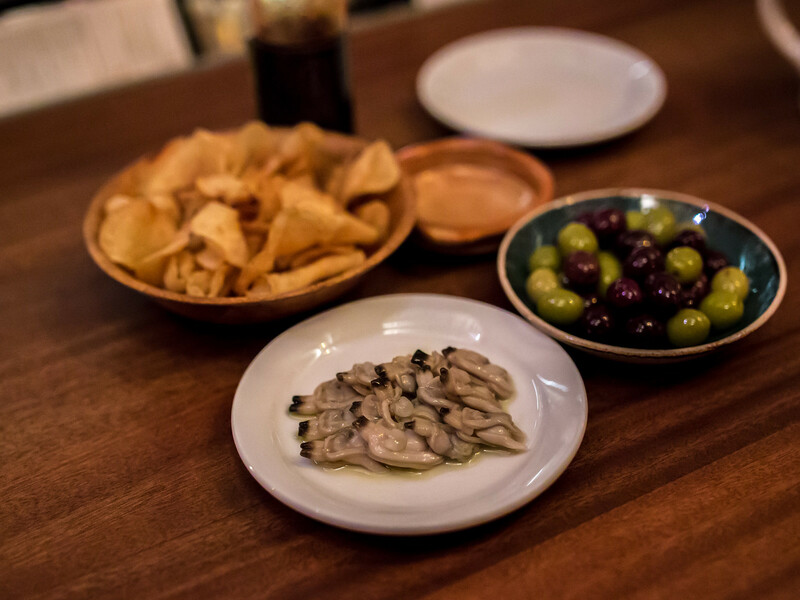 We started with a half order of clams ($20) from Bar Raval’s collection of canned specialties, which range from $15 to $68. At first, I was skeptical, but after eating the first sweet, succulent clam I was sold. Fished along the Galician coast and hand-packed, these clams were worth every penny, and more. 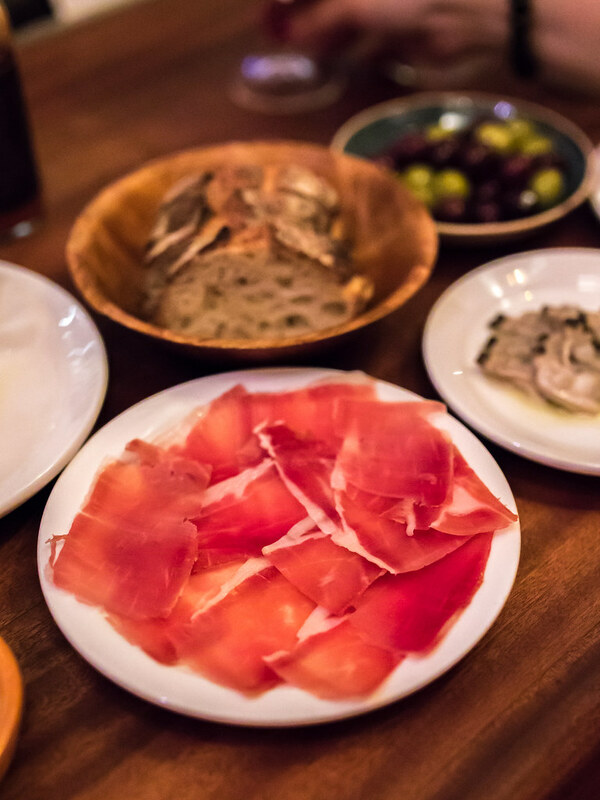 Other cold dishes were tried were the olives, fresh and fragrant, and serrano ham, salty but sweet. For hot dishes, we had the Hot Octopus, Chicken Gizzards and Chorizo Sausage with Quail Eggs. 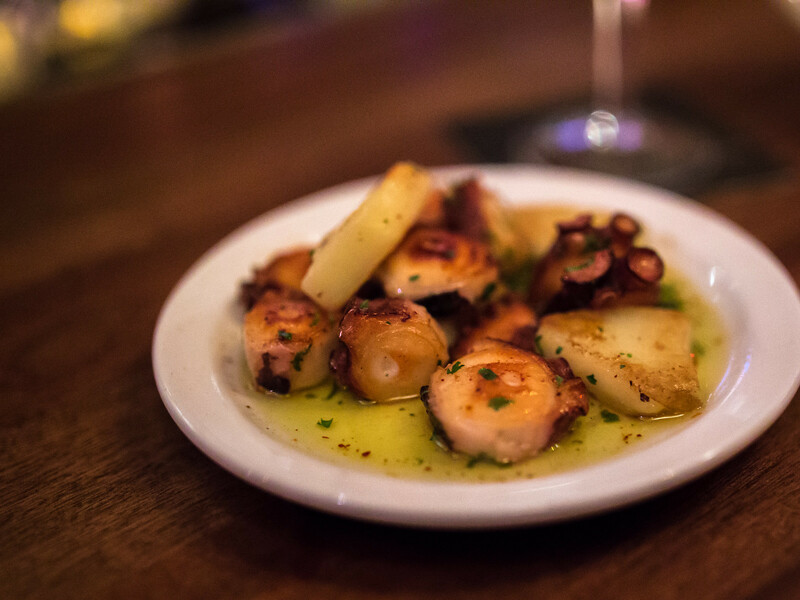 Served in olive oil, the grilled octopus and potato were well seasoned, tender and a great pairing for alcohol. The chicken gizzards were also incredibly tender, charred, skewered, served on a slice of toasted bread and under a blanket of spicy sauce. The couple next to us eyed our chicken gizzards and promptly ordered a plate for themselves. Our last, and most substantial plate of the night was the chorizo sausage. I thought the mini quail eggs were cute but I would’ve loved more yolk. The sausage itself was spicy, flavourful and criss-crossed with grill marks. I finished off every piece of fried potato with the mayo like sauce. Delicious. 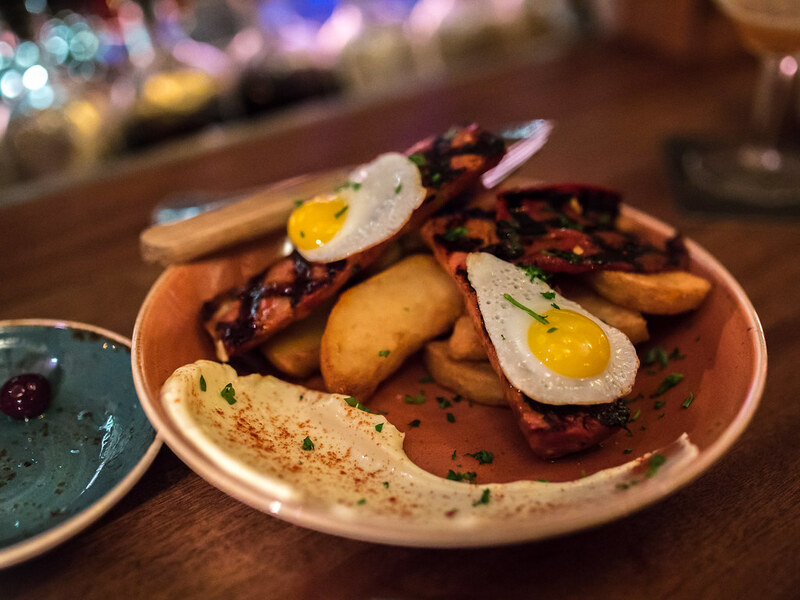 In general, I would say all of the dishes at Bar Raval were great accompaniments to a drink, the best kind of tapas. On my next visit, I have my eyes set on the canned seafood and marinated in house specialties.